Hello once again Empire Avenue! Are you looking to invest more Eaves in some of your favorite profiles? Do you want to invest in more Profiles generally? Or do you quickly need some cold hard Eaves to run a Mission with? What if I told you that there was one place on Empire Avenue where you could accomplish all 3, plus more? Nick the Intern here, and today I am highlighting the Empire Avenue Shop, your one stop destination for all of your Eaves, and Upgrades! The Empire Avenue Shop is where you want to go if you want to take your strategy to the next level. You can purchase upgrades to your abilities on Empire Avenue using either Eaves or real world currency. You can also purchase Eaves directly from the Shop if you are starting to run low. I have previously mentioned the benefits of putting your Profile on Vacation Mode (available in the shop, you can read more about that here), but let’s take this opportunity to highlight some of the more lucrative options available for you. 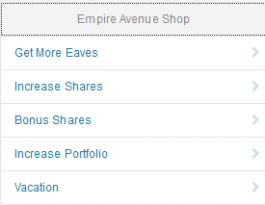 The default amount of shares you are allowed to invest in any profile when starting on Empire Avenue is 200. With Pie upgrades you can extend the maximum investments by 50 share increments all the way up to being able to invest 400 shares in any individual profile! The more shares you own in a profile, the more dividends you receive from their activity. The more Eaves you have, the more activity you can do on Empire Avenue (i.e Investments, Missions) so if you feel that you want to own more of your profitable profiles so to speak, this is the one way to gain even more value from them. Empire Avenue staff like to believe that pie is completely suitable as a meal (there’s fruit in it) and after a delicious, flaky, crusty meal we like to enjoy a nice dessert. We believe that others on Empire Avenue have a similar mindset, which is one of the many reasons we have Dessert on offer! Dessert packs are similar to Pie upgrades in that they allow you to purchase more shares in individual profiles, but think of Dessert as a super boosted pie with limited uses, because we were always taught that it is very possible to have too much of a good thing. Depending on your selection you can purchase even more shares in profiles, but be careful because as mentioned before the uses are limited. There are a variety of Desserts with different amounts of uses, as well as share bonuses so be sure to check those out, and see if making some room for dessert will help you make some Eaves! So you have been on Empire Avenue for quite some time, you have invested in 1000 profiles, and you want to invest in even more without selling anybody. What are you to do? Fear not, for the Empire Avenue shop has just the solution for you with Portfolio upgrades! Upgrading your Portfolio will allow you to invest in an additional 250 Profiles. There are multiple tiers of Portfolio upgrades each with 250 Profile increments, so you won’t have to worry about losing great investments, or accidentally hurting feelings by selling shares in other people to make room. The larger your Portfolio, the more investments you can have, and the more dividends you can receive. Remember quality over quantity, but sometimes quantity has its benefits as well. So please feel free to poke around the shop, and see if there are any upgrades that can help you bring your Empire Avenue experience to the next level. If you are looking to purchase larger bundles of Eaves or Upgrades than those specified in the shop, feel free to send us an email at sales@empireavenue.com with your request, and we can see what we can do. Let us know how upgrades have enhanced your experience in the Empire Avenue General Discussion Community, and don’t eat too much pie.